1. 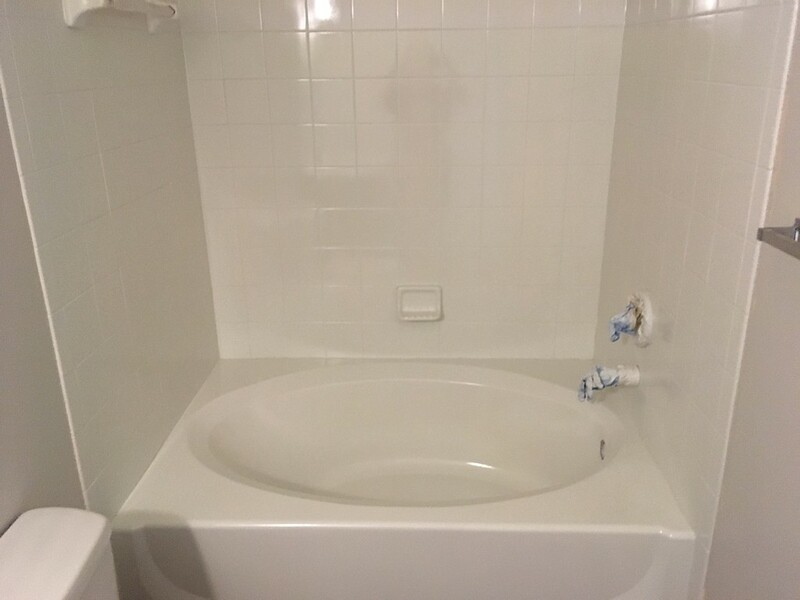 How much does it cost to refinish my tub, tile or countertops? Refinishing can cost between $285 - $2500, depending on whether it is a bathtub, surronding tile, shower, entire bathroom, or countertops. Please call us for more details. 2. Will you caulk my tub or tile? As a courtesy to our customers, we do caulking free of charge around the bathtub. However, because this is a courtesy service done in efforts of providing the most complete job possible and is free to our customers, we require all subsequent caulking touchups, etc to be done by our customers. Also, all caulking will stain and wear through the months and years as well, therefore we recommend that our customers subsequently replace the caulk as desired. 3. 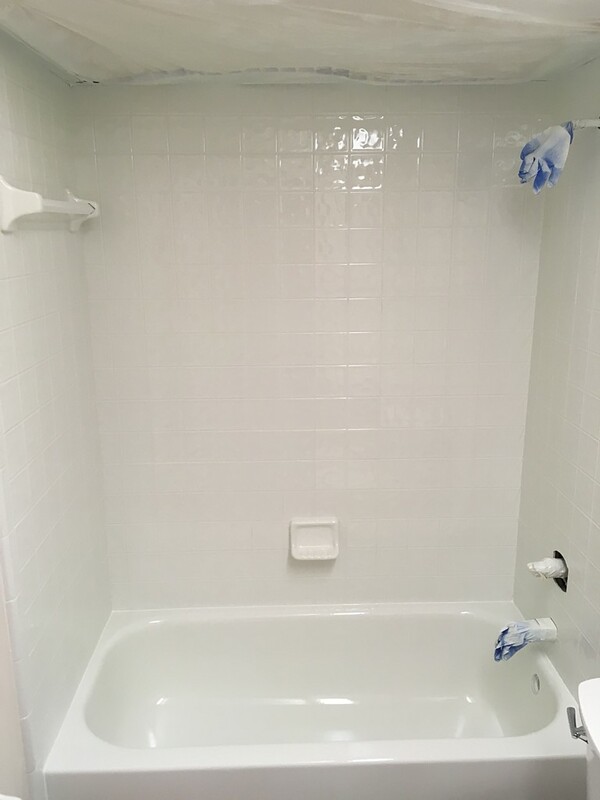 Do I need to clean my bathtub and/or tile before I have my surfaces refinished? Yes. Customer is responsible for cleaning the bathroom before the refinishing job, including the bathtub, surround walls, and ceiling. It is especially important to clean the entire bathroom if it has been under construction. This will decrease the chance of any dust or particles landing on the finished coating. We will still re-clean the tub and/or tiles with our special cleaners in order to properly prepare for the application of our coating, however, to prevent more dust or particles from landing on the finished coating, preliminary cleaning of the bathroom is necessary. 4. Should I remove my overflow valve or any other fixtures that are in my bathtub/shower? It is not necessary, but the fixtures can be removed if you would like to replace them with new ones. Otherwise, we will "mask" (cover/protect) the areas including the overflow valve, faucet and drain cap, protecting it from the overspray. Materials used to "mask" can be removed after the refinishing is complete, leaving masked areas undisturbed during the process. 5. How long will the refinishing process take? Generally speaking, tub refinishes may take about 2-4 hours. Tub and surrounding tile (tiles around tub area only) will take about 4-6 hours. This does not include any time spent to remove any old paint from a previous refinish if present. 6. How many years can I expect to get out of the life of my refinished tub and/or tile with proper care? We advise our customers to expect about 15-20 years from our refinish! Our new and improved methods of application provide the longest lasting finish out of the options available. 7. Will my tub or tile look like it was painted? Absolutely not. Our finish is applied using an HVLP sprayer and our products look very smooth and shiny as in the automotive industry. After it has cured, our finish looks very similar to automotive finishes. Many customers can not tell the difference between our finish and a brand new tub! 8. Will you fix chips and cracks in my tub or tile? We will absolutely put our best effort towards patching or sanding down any visible chips or cracks. Depending on the severity, our fixes may or may not result in a "perfectly seamless" look after it is refinished. However, we are trained to provide the best possible outcomes by "engineering" the best solutions for these conditions. With proper communication, a desired outcome is more commonly achievable. 9. Can I be present in my home and not be disturbed by fumes? Yes. We have found that 99% of our customers have no problems while being present when a refinishing job is being performed. This is so because we deploy heavy duty blower systems that ventilate fumes from the homes of customers and often keep any smells from escaping the work area. Customers are often surprised when comparing our reduced amount of fumes to many of our competitors. 10. Is white the only color available? No. We have many colors to choose from! However, there is often an additional charge for custom ordered colors. The stock colors to choose from are as follows: China White (Off White), Pure White, Bisquit, and Bone. Please feel free to call us for more details. 11. How long after my tub and/or surrounding tile is refinished do I have to wait before using it? Please allow at least 24 hours before using the reglazed tub or tile areas before using it. 12. What should I do to prepare for my refinishing job? Customer is responsible for cleaning the area of clutter before our arrival. Please remove loose items from the bathroom (or work area), such as tooth brushes, bottles, paintings, shower curtains/doors, rugs, soap and towels, etc., so that they will not be exposed during the job. 13. What are your recommended cleaning agents? Dawn dishwashing liquid, Formula 409 All-Purpose cleaner and Simple Green are three of the most popular cleaning agents that we recommend. All cleaning agents should be the bleach free versions. Never use abrasive cleaners such as Ajax, Tilex or Comet on any refinished surfaces. 14. Can I use a scrubbing pad to clean my tub? We do not recommend that you use a scrubbing pad. If cleaned regularly with a recommended cleaner, there should be no need to use an abrasive pad of any sort. You can use a soft sponge. 15. Is there an extra charge for removing old paint from a previously refinished tub? Yes, there is a $100 - $150 charge for stripping off the old paint. 16. I have a dripping/leaky faucet. Do I need to have it fixed before the refinishing job? Yes, you will need to repair any leaking and dripping faucets before the refinishing job for it will damage your newly refinished tub in due time. 17. There is a little surface dust stuck in the finish. What should I do? Surface dust is very common and almost unavoidable. There is always dust present in any room. Some comes from the clothes that we wear, pets, carpet from adjacent rooms, or from outside air. There will be surface dust that will stick to the finish as it is curing. This is normal. Whatever you do, do not try to pick at any, for you may chip the finish. Most surface dust will simply wash or fall off in time. With normal cleaning and use, you will see dust begin to fall off on its own and/or settle into the finish naturally. Do not be alarmed by surface dust, your surfaces will gradually smooth with time! 18. How do I know if my bathtub or tile surfaces have been refinished before? Porcelain, fiberglass and cast iron surfaces do not usually peel after wear. They will often only dull, stain, rust and/or become rough, but will not peel. If the tub is peeling then more than likely it has been refinished before. 19. Do you replace the drain? We do not replace the drain. However, the drain should be replaced by you or a licensed plumber before the refinishing job if you do wish to change it. Bathtub Refinishing is an economical way to transform your tired old bathroom into something new. Tile Refinishing can refinish your bathroom and kitchen tiles to match your decor. No ripping out old tiles. All work takes just a few hours. 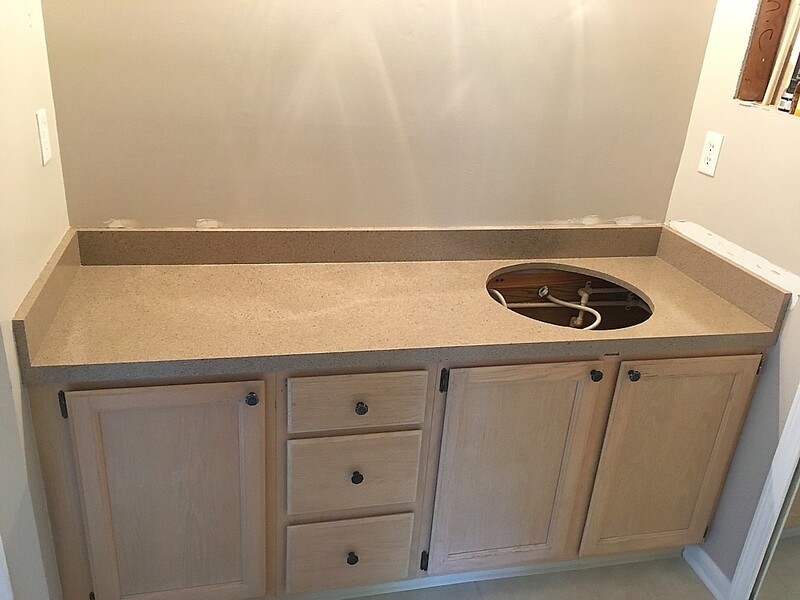 Counter-top Refinishing can give your kitchen counter-top new look without the high cost and mess of installation! © 2019 All rights reserved. www.PerfectRefinishingFL.com.